Let’s make it a double MPSA paper day. 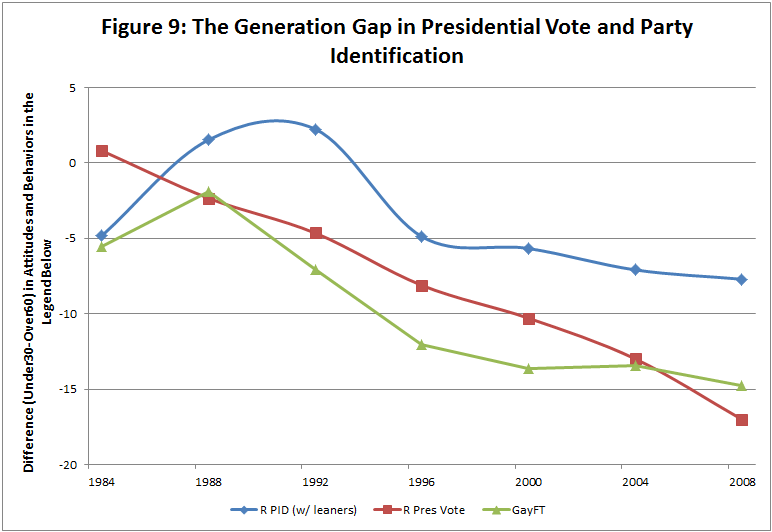 Here’s the final chart from my paper on the generation gap with Kyle Saunders. Each line is young voters (under 30) minus older voters (60 and over). Young voters have been getting more Democratic in their partisanship than older voters (blue line), but especially in their votes (red line), and their views on social issues (green line). It’s not all about gay marriage, but this is certainly a big part of the story. We’ve put this research together into a paper that we’re presenting this weekend at MPSA. 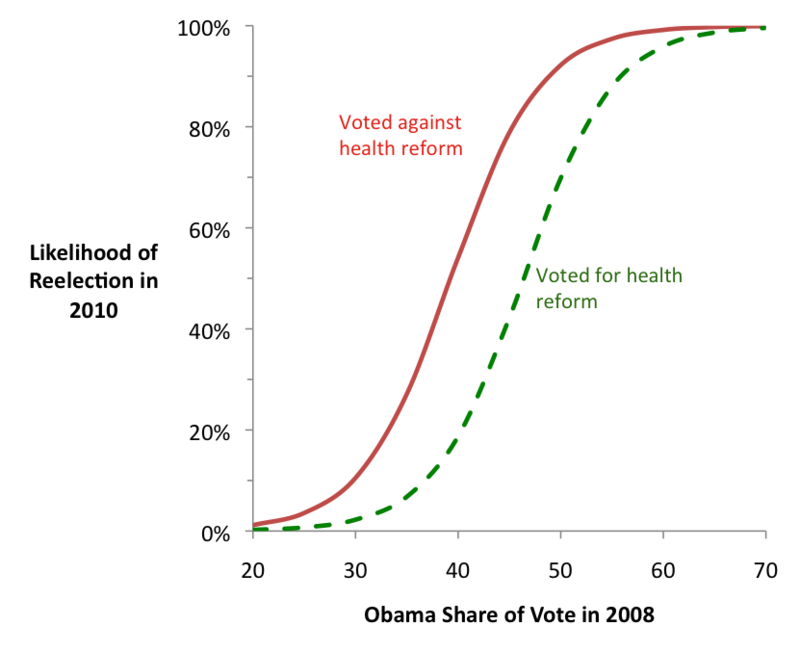 Here’s my favorite graph from our paper, showing the estimated impact of the health reform vote on Democrats’ likelihood of reelection. The patterns are generated by a logit equation and show how Democrats from a broad range of districts fared in 2010 based on this one roll call vote. For example, in a district where Obama got 40% of the vote in 2008, a Democratic representative would have a 54 percent chance of retaining her seat if she opposed health reform, but only a 19 percent chance if she supported it. At first, that graph may not look all the dramatic, but you need to consider a vertical line running through the graph at whatever Obama vote percentage you find interesting. There’s a huge amount of space between these two lines on the y-axis representing likihood of reelection. And, just so we’re absolutely clear, if these results are totally accurate, I still endorse a vote for health reform 100%. Some votes are worth losing your seat over and I can think of few that would be more worthy. I think it is genuine shame that our best evidence suggests that this important vote on legislation that will materially improve the lives of millions indeed really cost many Democrats at the polls. Of course, if I were a Republican, I’d just bury the results. But us liberals are open-minded. Was Va Tech wrong on the day of the shooting? The federal government said Tuesday it plans to issue the maximum possible fine against Virginia Tech– $55,000 — for violations of a campus safety law in connection with the 2007 shooting rampage that left more than 30 students and teachers dead. A federal official wrote in a letter to university President Charles W. Steger that the penalty for failing to provide timely warnings about the threat to the campus on the day of the massacre should be greater. “Virginia Tech’s violations warrant a fine far in excess of what is currently permissible under the statute,” Mary E. Gust, an official in the Education Department’s Office of Federal Student Aid, wrote to Steger. Her conclusion represented a stinging rebuke for Virginia Tech, which has sought for nearly four years to overcome wounds inflicted by the deadliest school massacre in U.S. history. It also bolstered the view of some relatives of the shooting victims that the university was negligent in efforts to protect the campus community. I emphatically disagree. Early that morning Virginia Tech officials were confronted with what looked like at the time, from all reasonable appearances, to be an isolated act of murder between individuals who knew each other. There was absolutely nothing to suggest that this was the just the first killing in what would turn out to be the infamous killing spree hours later. Should a campus of 20,000 students automatically shut down because one of its students is murdered– in a crime that police consider to be isolated and with a killer with a known motive? Maybe you can argue that, but it is entirely reasonable to notify students and simply move on. Maybe Virginia Tech should have known better, but they were going with the best information supplied at the time. I don’t think I want to live in a world where we always have to consider the absolute worst possibility. Where any shooting anywhere may be the prelude to an unprecedented mass murder. Looking at the totality of the evidence, I just don’t see how you can blame the University for their actions. According to a recent study in Britain, women say they feel “over-the-hill” by 29, while men feel over-the-hill by 58 years old. And the reasons are the best part: Women feel old when they spot their first gray hairs and start acting like their mothers; men feel old when they can no longer perform in the bedroom and start to become annoyed by loud music in bars. I’ll not comment on the first part, but I can say according to the loud music in bars standard, I’ve been over the hill for a long time. I spotted some gray hairs a few years ago, but since they seem to be colonizing very slowly, it doesn’t really bother me. And to Kim’s credit, I don’t think she feels particularly over the hill. Of course her hair color is still great. I am 29 years old, and I find the idea that I am over-the-hill ridiculous. Who wants to be 22, anyway? I was clueless at 22. Now I know what’s up… at least more than ever before, and I know I’ll only get smarter. I.e., the debate has always been about the things that simply lack the potential to make meaningful changes in our budget deficit. Or as Drum puts it, the debate is about programs where money goes to help less well-off Americans. So frustrating how many people fall for all the ridiculous Republican posturing on the deficit. I guess that’s why PT Barnum remains among my favorite people to quote. We will have high-definition, wide-screen television sets and a push-button dialing system to order the movie you want at the time you want it. You’ll not go to a video store but instead order a movie on demand and then pay for it. Videocassette tapes as we know them now will be obsolete both for showing prerecorded movies and for recording movies. People will record films on 8mm and will play them back using laser-disk/CD technology. I also am very, very excited by the fact that before long, alternative films will penetrate the entire country. Today seventy-five percent of the gross from a typical art film in America comes from as few as six –six– different theaters in six different cities. Ninety percent of the American motion-picture marketplace never shows art films. With this revolution in delivery and distribution, anyone, in any size town or hamlet, will see the movies he or she wants to see. OK, so the CD became DVD and 8mm didn’t really go anywhere, but otherwise, Ebert got it pretty much right on the money. I’ve never tried predicting more than an election in advance. Very impressive.